In the works since 2013, plans and prices for a greenhouse at Loyola campus still haven’t taken root. With estimates and proposals ranging between $150,000 and millions of dollars, last week’s Concordia Student Union meeting demonstrated that the student governing body still hasn’t decided what direction they want the project to take. Certain details were revealed at the meeting, however. The greenhouse, when completed, will operate with the help of City Farm School. Of the three designs proposed in a feasibility study from last February, two have already been ruled out, while the third is still under consideration. The third plan was carried out over the winter of 2014 and asks for traditional ground level or slightly underground greenhouse. 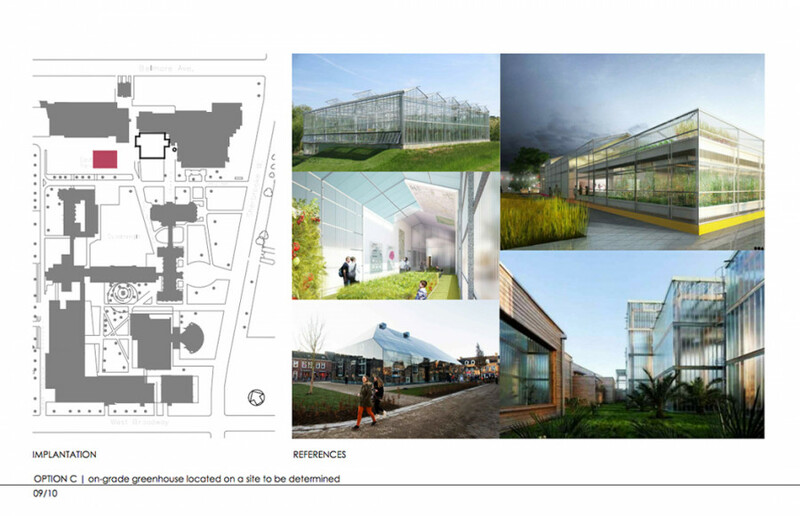 Such a greenhouse would be independent of other buildings on campus—requiring new utilities infrastructure—and would sit farther away from the Student Centre building, making it less accessible and visible. It would potentially be less expensive, according to Terry Wilkings, General Coordinator of the CSU, who estimated the cost at approximately $150,000. The complicating factor for the third design is that, according to statements made at the meeting, no new buildings are allowed to be built on Loyola campus. There’s a moratorium, and moving forward with an independent structure would require a lot of bureaucratic maneuvering, Wilkings said. Wilkings said that they would try and decide which design to develop by next month. Once that happens, a more accurate price can be estimated. Having a greenhouse at Loyola is important, said Caron, because it would extend the growing season from its current four to six months, up to ten months, reducing the need for the school’s food providers to import fresh food. The fact that so many on-campus food providers could take advantage of the extended growing season makes it even more attractive, Caron said, pointing to The Hive Cafés on both campuses, Café X and more. And, by partnering with City Farm School—right next to the Loyola—she said it would make operating the greenhouse easier, letting students participate and learn, and reduce costs by leaning on an existing market.